The ABC E-C/C-E book was published in November, 2010. It's the latest book in the ABC Dictionary series. Its ISBN number is 978-0-8248-3485-2 and you can find it at the UH Press website for only twenty dollars! 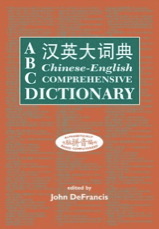 The ABC Dictionary team, including chief editors John DeFrancis and Zhang Yanyin, and series editor Victor Mair, assisted by Wenlin Institute, worked on it starting before the Comprehensive edition was published in 2003, and that work has come to fruition. The English-Chinese part is entirely new. It has numerous example sentences to benefit learners of both Chinese and English. Chinese glosses and example sentences are in both pinyin and simplified characters. English pronunciation (west-coast American) is provided in IPA (International Phonetic Alphabet) symbols. The Chinese-English side is an abridged version of the Comprehensive edition with many improvements. All Chinese headwords appear in pinyin and both simple and full form characters. New example sentences have been added, all with both pinyin and simple form characters. An electronic unabridged version of E-C/C-E was first published with Wenlin version 4, and we are constantly improving it. July 2003 (slightly revised through July 2005): the Comprehensive book is out! Its ISBN number is 0-8248-2766-X and you can find it at the ABC Chinese Dictionary Series, and at various bookstores. We enthusiastically recommend the book! Unlike the software, it requires no electricity. And, unlike any other printed Chinese dictionary, it makes it easy to look up any word if you know its pronunciation, even if you are unsure of the tones and may not know how it is written in Chinese characters. In April, 1997, Wenlin Institute, Inc. signed a license agreement with the University of Hawaii, to combine Wenlin with the ABC (Alphabetically Based Computerized) Chinese-English Dictionary, edited by John DeFrancis. One and a half years later, publication of the integrated product Wenlin 2.0 was finally announced. By far the greatest improvement ever to happen to Wenlin is combining it with this top-rate dictionary containing over 72,000 entries; but that was not the end of the story. John DeFrancis and his team (now including Tom Bishop of Wenlin Institute) continued working on the dictionary, increasing the number of entries to over 196,000 and making many more improvements. The new Comprehensive ABC Dictionary was first included in electronic form with Wenlin 3.0, released in July 2002, and the book was published by the University of Hawaii Press in July 2003. The biggest transformation is in the cidian -- the number of entries went from about 14,000 in Wenlin 1.0, to over 74,000 in Wenlin 2.0, to over 196,000 in Wenlin 3.0! Nearly all the entries in the old cidian had corresponding entries in ABC that were more extensive. Where ABC and the old cidian both had entries for the same word, the ABC entry is always used as the main entry in the new cidian, and the old entry is appended below it, separated by a horizontal line. Most of the old entries are superfluous, but a few may have some value. Wenlin's zidian is separate in origin from ABC, but has also undergone numerous improvements since Wenlin 1.0, including corrections to pronunciations for consistency with the ABC cidian, as well as the addition of many new entries for characters that were too rare even to be included in ABC. In addition to using ABC with our own software, Wenlin Institute is authorized by the University of Hawaii to grant sublicenses to other software developers and researchers. We welcome all inquiries about sublicensing. Please see the UH OTTED web page concerning ABC, and also our own page about developer and researcher licenses.